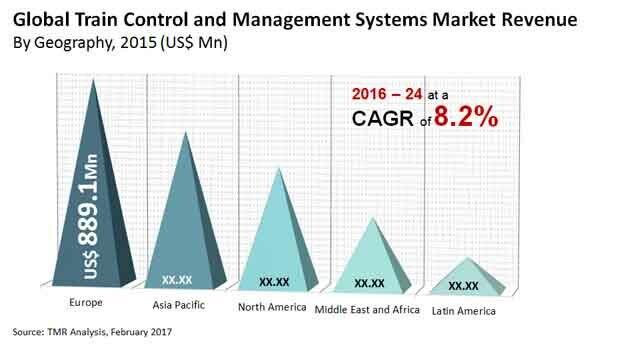 The global train control and management systems market is highly influenced by the growing demand for rapid rail transit systems across the world. The ever-rising population, worldwide, has increased the need for the up-gradation of the existing transportation infrastructure. Conforming to the need, the investments in the intercity high-speed rail lines have escalated phenomenally, resulting in the expansion of the light rail systems and subways in a number of regions, globally. As train control and management systems help in gaining a centralized control over various subsystems of a train, their deployment is likely to accelerate substantially with the development in the railways sector over the forthcoming years. However, various risks associated with train control systems, such as failure of positive train control systems resulting in train collisions and train derailments, may create obstacles in the growth trajectory of this market in the near future. The global market for train control and management systems was worth US$2.5 bn in 2015. Analysts estimate this market to rise at a CAGR of 8.20% from 2016 to 2024 and reach US$5.01 bn by the end of 2024. Positive train control systems, integrated train control systems, and communication-based train control systems have surfaced as the key train control and management systems used across the world. Among these, communication-based systems enjoy a greater demand than other systems and will remain doing so in the near future, thanks to the benefits offered by them, such as the reduced maintenance costs and enhanced interoperability. The demand for positive train control systems is also expected to increase steadily over the next few years, owing to the rising knowledge about various safety features provided by these control units, such as line speed enforcement, collision avoidance between trains, temporary speed restrictions, and rail worker wayside safety. The worldwide market for train control and management systems is spread across Europe, Latin America, Asia Pacific, the Middle East and Africa, and North America, among which, Europe has emerged as the leading regional market, thanks to the presence of established train control and management systems manufacturers. Analysts expect this regional market to remain on top over the next few years, progressing at a CAGR of 7.70% between 2016 and 2024. North America, which surfaced second in the global market in 2015, is expected to retain its position, offering lucrative opportunities for market’s rise, in the years to come. The significant rise in the government expenditure on various high speed rail projects in this region is anticipated to boost North America market for train control and management systems. Asia Pacific is also projected to witness a considerable expansion in its train control and management system market in the near future, owing to the surge in the need for energy efficiency and the reduction in road traffic congestion. The escalating public investment in rail projects and the development of railway infrastructure is also estimated to support this regional market over the coming years. Some of the leading manufacturers of train control and management systems across the world are Alstom SA, Siemens AG, Hitachi Ltd., Bombardier Inc., Mitsubishi Electric Corp., Strukton Rail, Toshiba Corp., EKE Group, Thales Group, and General Electric. The train control and management system controls the operation of brakes, doors, air-conditioning and other subsystems in the train, and is often termed as the train’s nervous system. It is a train-borne distributed control system and comprises computer software and devices, analogue and digital input/ output capability, human-machine interfaces and data networks to attach all these together in a fault resistant and secure manner. TCMS provides data communications interfaces to other train-borne systems, and also telecommunications to supporting systems operating remotely on the wayside. Rapid transit vehicles are gaining popularity owing to high passenger capacity and rapid mobility of these vehicles. Developed countries of North America and Europe have improved infrastructures for rapid transit trains such as monorails, metros and subways. Governments of developing economies such as China, India, Thailand, Singapore, and Malaysia among others are investing in these types of transport systems to reduce traffic congestion on roads. Moreover, rail systems offer a wide range of benefits over other modes of conveyance, such as energy efficiency and reduction in road traffic congestion. Hence, the increasing demand for rapid transit systems is likely to fuel the demand for train control and management systems market during the forecast period. Train control systems allows efficient management of railway traffic, optimal utilization of railway infrastructure and provide improved reliability. However, there are various risks associated with these systems. For example, failures of positive train control systems can result in train collisions and train derailments. Such factors are likely to hinder the growth of the market during the forecast period. Leading manufacturers are continuously focused on technological innovation and integration in material composition and design of train control and management systems, which in turn is expected to create significant growth opportunity for the market. This report on train control and management systems market highlights the current market summary scenario along with the future expected market growth during the forecast period from 2016 to 2024. Moreover, various economic, political, technological and social factors that are likely to affect the present and future demand of TCMS have also been provided in this report. In addition, information of major players operating in the market along with their market share and major strategies adopted in order to maintain leading position is also given in this report. The report also contains the current market size in terms of revenue (USD Million) and predictive forecast from 2016 to 2024. On the basis of geography, the market has been classified into North America, Europe, Asia Pacific, Middle East and Africa and Latin America. Based on trains type, the global train control and management systems market is majorly driven by metros and high speed trains with highest market share in 2015. There has been increasing government investments in rapid transit projects and modernization of rail infrastructure worldwide. Moreover, TCMS is an essential part of rapid transport vehicles and thus the growing demand for high speed trains and metros is likely to enhance the demand for TCMS market. By components type, the computer control units segment held the largest share of the market in 2015 and is expected to maintain its dominance in the coming years. These units avoid the need for time consuming physical access and costly routine maintenance. On the basis of train control solutions type, communication based train control segment dominated the market in 2015. With the help of these systems, the exact position of the train is known more accurately than conventional signaling systems. Some of the major players operating in the train control and management systems market include Alstom SA (France), Siemens AG (Germany), Bombardier Inc. (Canada), Hitachi Ltd. (Japan), Mitsubishi Electric Corporation (Japan), Toshiba Corporation (Japan), Strukton Rail (Netherlands), Thales Group (France), EKE Group (Finland) and General Electric (U.S.).